The Last Night is an absolutely breathtaking novel by Cesca Major, I have goosebumps just thinking about it to write my review. It starts in 1952 with quite a disturbing scene when a young girl finds a body in the sea. All I could think about at first is whose body is it and how did it get there, but Cesca Major very cleverly distracted me with such interesting stories of two vibrant main characters. Told from a few different viewpoints, the main characters being Irina in the present day of 2016 and Abigail in the past of 1952. The two become linked in a most intriguing way when Irina receives an old bureau to restore. With locked drawers and hidden compartments, Irina strives to unearth the secrets held within. Some items appear strange and worthless but they clearly meant a lot to the owner of the bureau for the items to be hidden and kept safe. Items that we keep to remind us of a treasured memory are so very priceless and irreplaceable, making them worth more than gold. Irina is such an interesting woman. We learn early on that she has some terrible scarring on her face but it is not until near the end of the book that we find out what happened to cause this. Her guilt and fear cause her to push away her loved ones but it is to her ex, Andrew, that she turns when she tries to uncover the secrets of the bureau and things start to go bump in the night. Told with such breathtaking vividness, and based on true events, The Last Night is written so beautifully that it broke my heart in two. The powerful emotional writing had me struggling to contain my fear and my tears as I raced through the pages of this amazing book. 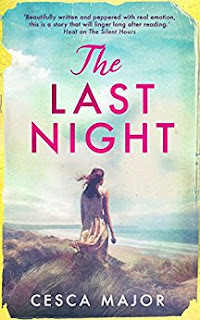 With such stunning narrative, Cesca Major has ensured that events of that night, the last night, will never be forgotten. There's not a word out of place in this fabulous five star read and it's a book I know that I will remember for many years to come. I chose to read an ARC of The Last Night and this is my honest opinion.